Do you want to know where I get my artistic inspiration? Sometimes I don't need to look any further than right outside my studio door. 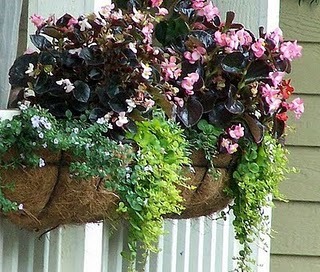 It can be as simple as sweet little things in life like discovering a delicate new bird's nest lined with my horse's white mane hair, tucked securely inside the studio window flower box. Can you see the horse hair lining? 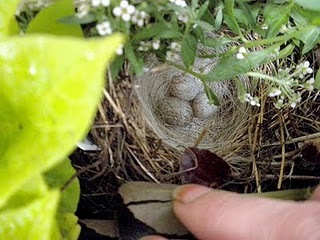 A week later I checked the nest to find three brown speckled eggs. There were five in total. Couldn't believe how quickly the little babies hatched! Seemed like days instead of weeks. 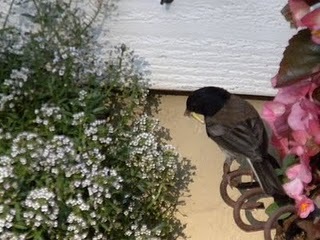 Here's the daddy with breakfast in his beak. 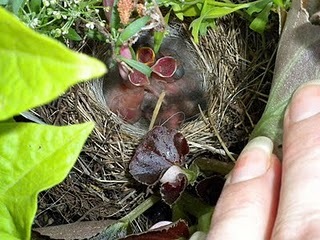 We're pretty sure this is an Oregon Junco family. 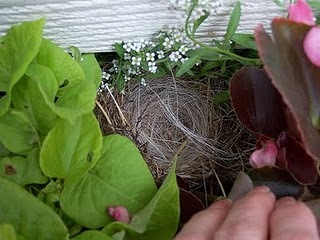 Maybe the same one that built their nest last year inside our Christmas wreath on our front porch. To be continued, will try to get a few more pics of the babies when they get bigger.